This is too awesome for words. Brings me back to the days when my life's dream was to grow up just like Donatello...'ninja dancing,' crime fighting, and chowing pizza around the clock. But I wonder...who is painted on the thumb??? I wonder if the thumb has April, Splinter or Shredder... hmm. 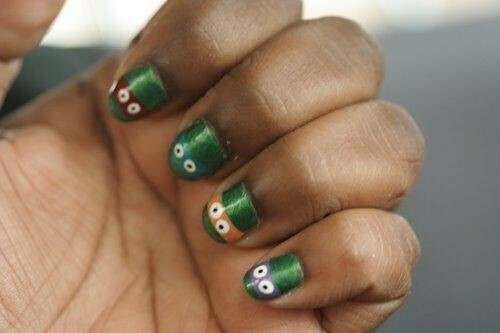 I love the ninja turtles! esp on my nails. that's awesome! OMG too cool! So funny! I'm totally doing this today! !